Okay, getting out of bed is hard, let’s face it. The alarm goes off, and all you want to do is lie there and sleep. Unless it’s a weekend! Then you’re out of bed like a shot, even though your goal was to catch up on all that sleep you missed during the week. 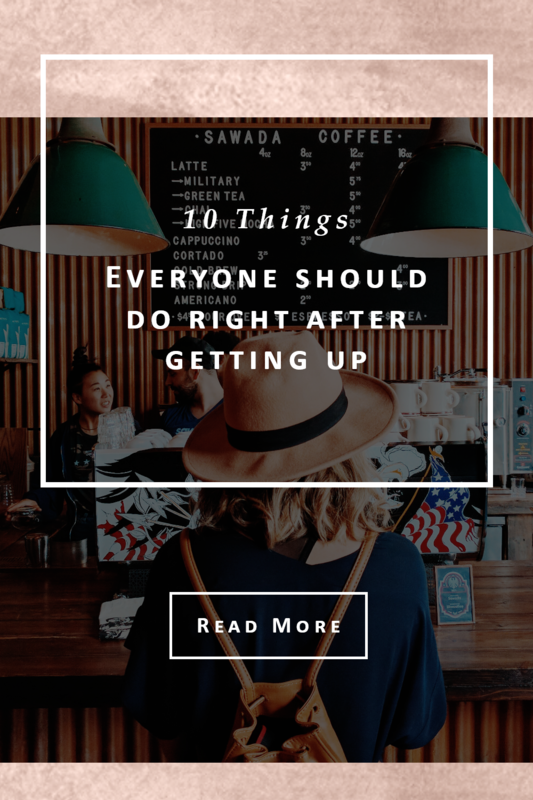 Since I work from home, I have to have a ton of discipline, so here are 10 things I do when I get up in the morning to start my day right! Get up when the alarm goes off, preferably at the same time every day. You can train your body to get into a sleep routine, so pick the time that you want to go to bed (determine how much sleep you need each night, I get up at 6 and need at least 7 hours of sleep, so I go to bed at 11 p.m.). Now my body is in a routine, I fall asleep at 11 pm and usually am awake before the alarm goes off, feeling refreshed. Meditate, pray or reflect. I don’t care what religion you are, or if you’re nothing at all. If you’re anything like me, your mind is going a mile a minute upon awakening, running through all the unpleasant tasks you have to do throughout the day, and the stress just starts. I try to take a few moments to quietly reflect and meditate on the greater world, it helps me to realize that my problems are so insignificant in the grand scheme of things and helps me to keep a sense of perspective throughout the day. Drink a glass of water. Study after study tells us to start the day with a glass of water. If nothing else, it eliminates nighttime dehydration. Don’t immediately launch into social media surfing. I know, I know, it’s such a temptation to hop onto Facebook or Instagram and see what happened during the night (probably nothing, because all your friends were sleeping). But for me, getting right on social media just stirs me up when my goal is to ease into the day. Yeah, a cute kitten meme is nice but I don’t need to immediately launch into someone’s political manifesto, too harsh! Same with the news. I know it’s tempting and I think it’s important to know what’s going on the world, but once again, no sense in getting all riled up before you have to, right? News comes on at night too. Make your bed! If there is one thing I think that all successful people do, it’s to make their beds when they get out of them. Making the bed removes any temptation to get back into it, and right away you’ll feel like you’ve accomplished something. Plus I’m always way more productive when my surroundings are nice and neat. Do all of your ironing and picking out your work outfit the night before. That way you’re not rushing around in the morning trying to iron and finding out that the thing you wanted to wear is dirty. Remember, the point is to ease into the day. Coffee or tea. Some people don’t do caffeine, but I couldn’t live without it. Invest in a coffeemaker with autobrew, trust me, it’s a beautiful thing to wake up to a freshly-made pot of coffee. Exercise. I prefer to exercise in the morning. I feel much more energetic in the morning and so much fresher, and then I only have to shower once. Plus, it puts me in a much better state of mind for the day, the stress-relieving effects of morning exercise last all day long. Shower. This might be a no-brainer, but when I had bleach blonde hair, I showered at night because it took forever to blow out my hair in the morning. Well, my hair paid the price for that as did my morning peacefulness. Now I don’t start the day without a shower, it’s not just about being clean, it feels great and it’s so refreshing. Invest in your favorite scented body wash or soap, something with verbena or lemon is great, it will wake you right up. I feel at my best when I’m rested, exercised, clean and caffeinated! These might be simple tips, but I like to have a productive day every day if possible, and starting the day off right makes a world of difference! Got any tips of your own to share? I’d love to hear them, comment below!